Go behind the scenes as Will Smith dances on top of a bridge in Budapest. 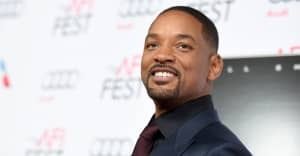 Will Smith recently took his followers up to the top of a bridge in Budapest for the most ambitious #InMyFeelings challenge to date. Smith's thirst for likes aside, you might have wondered what went into making that video. Luckily he's shared a follow-up clip on YouTube appropriately titled: Drake Almost Got Me Killed. In the video we see behind the scenes footage from Hungary, including Smith's admission that doing it for the gram is, at it's core, "social media stupidity." Much of the video focuses on the legality of scaling a bridge without permission and Smith psyching himself up to scale it. Just in case you were thinking of heading to Budapest to recreate the footage, Smith is keen to stress that you don't. “Do not attempt the stunts depicted in this video under any circumstances," he says. That's that settled then. Check out the video above.